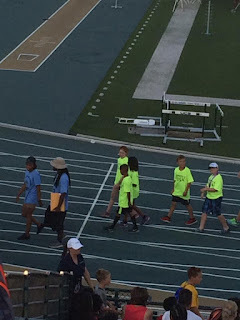 Tales of a Pee Dee Mama: What a Week! This week, Little Red and I flew out to Sacramento, California, for her to compete in the USA Track & Field National Jr. Olympics. After a crazy day of flying and arriving home at 5:45AM, I am too exhausted to write much today. I will share our trip with you all in a couple of days when I've recovered from jet lag! Here's one picture of her with her teammates walking in for the Opening Ceremony.